Boracay has changed a lot through the years. Construction of new buildings never seem to stop, be it in the beach front or in other beaches and coves in the island. One of the positive things about this development boom, I guess, is the food. There are now more restaurants in Boracay than ever. From cheap street foods to expensive exotic cuisine, Boracay is sure to have something for every budget and palate. 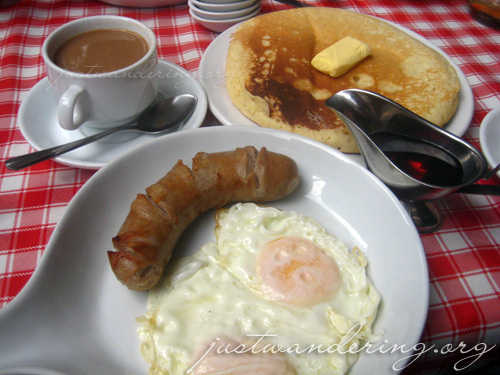 One of the well-known restaurants in Boracay is Gasthof. Proclaimed as serving the best baby back ribs in Boracay, it’s a title that’s well deserved. The ribs are marinated in Gastof’s special marinade, and grilled upon order. The ribs are serve at the table still hot, with a dollop of sauce and tender meat that’s practically falling off the bone. One order of ribs costs Php 550; pricey, but it’s a 5-piece rib that’s packed with meat, perfect for sharing. Relatively new in the island, though quickly becoming a favorite among locals and tourists is Kasbah, a Moroccan restaurant. Located way out in Station 1, right beside Discovery Shores. It’s a fair walk from Station 2, your progress made even slower by the soft sand. But the walk is so much worth it, as you take in the gorgeous Moroccan lamps that lit up the place, and you get a taste of authentic Moroccan cuisine. The kemias, the kebabs, the tagines, the tea… I loved them all! It comes with a pretty hefty price tag though, so be sure to bring lots of cash when you dine here — the ATM is a long walk from the Kasbah! I have been hankering for the dish I had at La Sirenetta in Coron. The restaurant in Coron was actually a spinoff from the Boracay original, Cafe del Mar. Decorated with the trademark mermaid pillar, this was no doubt the same restaurant. The food served had strong Western influence, while using locally sourced ingredients. 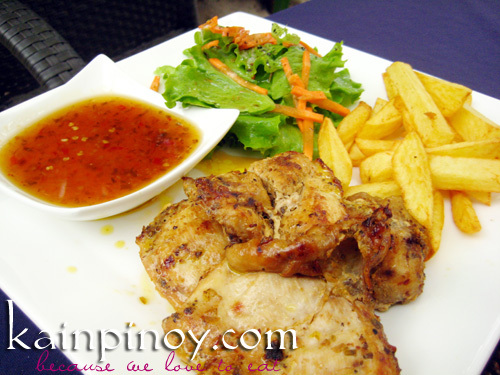 I ordered the same dish as I did in Coron, the Cafe del Mar Chicken. Grilled (or was it fried?) herb seasoned chicken breast with a side of fries, salad with vinaigrette and a spicy, tangy dipping sauce. I also ordered the same appetizer we had at Coron, but this time, with four dips, instead of just hummus. 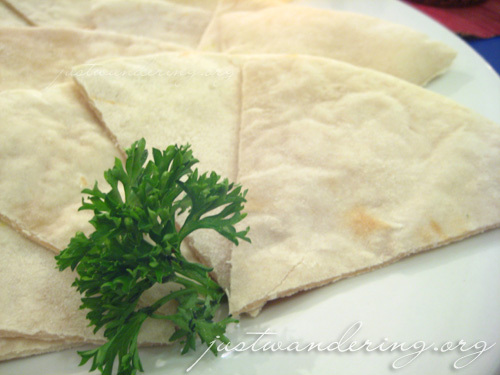 The pita bread was fresh, soft and chewy. The dips were pretty good as well, and the chicken dish as I remembered it. Cafe del Mar is a bit expensive, and though I’d love to try their other dishes, I’d probably only eat there again if I have friends with me to split the bill. The restaurant is located in Station 1. The Lemoni Cafe (or Lemon Cafe as others say), is located right smack in the center of D’mall, across the Ferris wheel. The restaurant’s light and airy interior is inviting, and if that doesn’t lure you in, the dessert display will surely do. They are offering a lunch box special, where for Php 450, you get the soup of the day, salad with their raspberry vinaigrette, your choice of sandwich and dessert. Yummy and filling, this is a great value meal for the price. Jonah’s Choco Banana Vanilla Shake, a good book and a great view. No, I did not forget about Jonah’s! I was merely saving the best for last. Jonah’s is a Boracay institution: you haven’t been to Boracay if you haven’t tasted Jonah’s shake. The shakes at Jonah’s are the perfect for keeping cool under the sun. There are plenty of flavors to chose from — there’s one that sure to please the most discerning of tastes. What I like best about Jonah’s is that the shakes taste real. It doesn’t taste of artificial flavoring, but of the fruit itself. For only Php 90 for a tall glass of delicious shake and a spectacular view of the fine white sand and glistening blue sea of Boracay, Jonah’s is certainly hard to top. Okay, so Jonah’s wasn’t the last on the list! 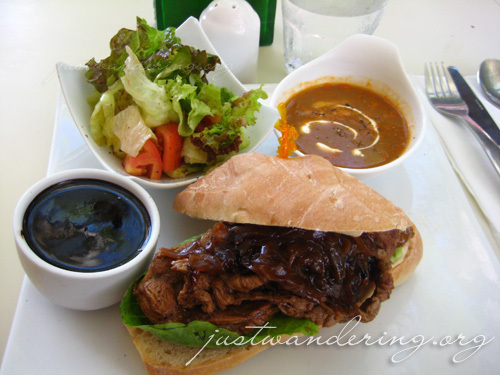 Another favorite and a must try when in Boracay is the Choriburger. Short for chorizo burger, it is made with grilled chorizo in a hotdog bun and slathered with sweet or spicy sauce. It’s the perfect thing to munch on as you watch another spectacular Boracay sunset. 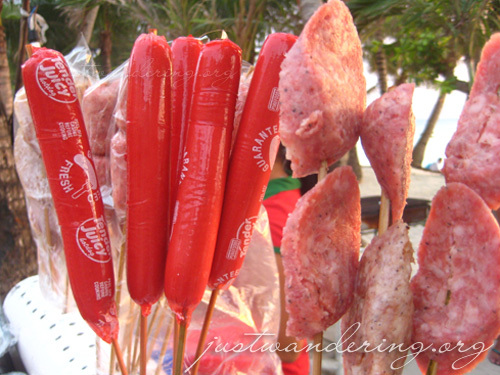 Choriburgers are sold along the beach road at the numerous grill kiosks that pops up late in the afternoon. Aside from choriburgers, you can also buy other street food favorites like barbecue, isaw (intestine), tenga (pig’s ear) and hotdog. [Update March 29, 2016] This post was written 7 years ago. 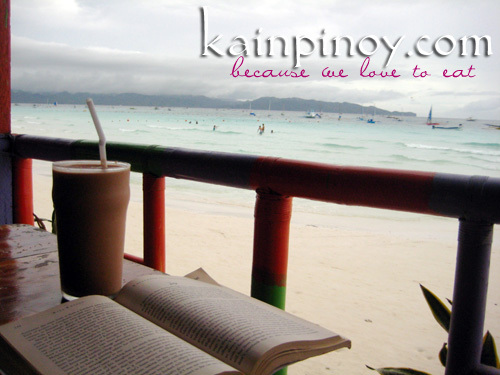 The Boracay Compass has a recent, more detailed guide to Boracay Restaurants. Seair flies daily to Boracay, with as much as 11 flights from Manila to Caticlan. Book your flight now by calling the Seair hotline at 849 0100 or book online through www.flyseair.com. saraaaaaaaaap. =p i need to go down to 7/11. Need to feed myself after seeing this post. Yes! I swear, sakit sa ulo yung nangyari! grabe! your site is such a big help! keep it up! thanks for this! very helpful for setting a budget aside. i’d just like to know, are these prices usually for lunch? what would you say the cost of dinner would range around? Hi! Its really good knowing there are still places in Boracay we can stay at an affordable price. We are booking a stay at Tans Guest House this October 2010, I was just wondering how much budget i should make arriving at kalibo. I mean the land/sea transfer. I totally agree! Every disadvantage has it’s advantage, luckily.